The highly efficient Hyundai automatic transaxle has four forward speeds and one reverse speed. It has a conventional shift pattern as shown in the illustration. Never shift into "R" or "P" position while the car is moving. For optimum fuel economy, accelerate gradually. The transaxle will automatically shift to the second, third and overdrive gears. Use to hold the vehicle in place when parking or while starting the engine. 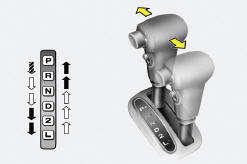 Whenever parking the car, apply the parking brake and shift the selector lever to the "P" (Park) position. In the "N" position, the transaxle is in neutral position, which means that no gears are engaged. The engine can be started with the shift lever in "N" position, although this is not recommended except if the engine stalls while the car is moving. Use for normal driving. Bring the car to a complete stop before shifting the selector to "D" position. The transaxle will automatically shift through a four-gear sequence. Never downshift manually to "2" position or "L" position when vehicle speed is more than 60 mph (96 km/h). Use for driving on a slippery road, hill climbing or engine braking downhill. "2" automatically shifts between first and second gears. This means that no shift-up to 3rd gear is performed. However, the shift-up to third gear is done when the car speed exceeds a certain value to prevent the engine from over-revving. Manually move the selector to "D" returning to normal driving condition. Use for driving up a very steep grade or for engine braking when descending steep hills. When downshifting to "L", the transaxle will temporarily remain in second gear until the vehicle has slowed enough for low gear to engage. Do not exceed 31 mph (50 km/h) in low gear. o It is always possible to shift from "R", "N", "D", "2", "L" position to "P" position. o Always apply the footbrake when shifting from "P" or "N", to "R", "D", "2" or "L" position. o When accelerating from a stop on a steep hill, the vehicle may have a tendency to roll backwards. Shifting the shift lever into 2nd gear will help prevent the vehicle from rolling backwards.